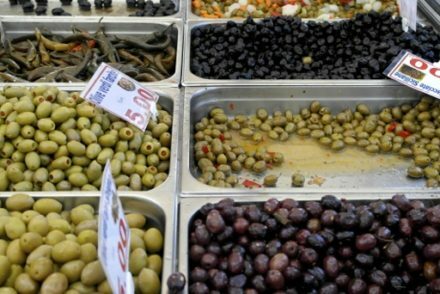 When we talk about the Mediterranean diet, one of the foods that comes to mind are fish. It is recommended that we eat fish at least twice a week. The reality is that many of us do not eat fish even once a week. Why? Well I can think of a few reasons: many of us think that it is a lot of work, we never prepare fish at home and because really it is not part of our weekly routine. In reality, fresh fish are easily cooked at home as long as someone cleans them for you. But I’ll talk about that another time. I have a much easier idea to propose. Yes, canned fish. 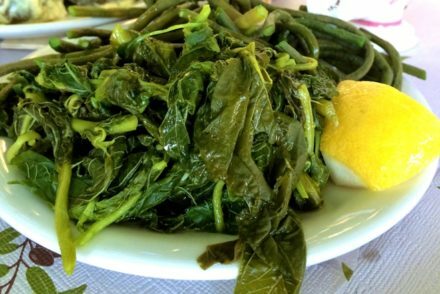 While Greeks prize fish and it is part of their traditional Mediterranean diet, it is not in the way you think. Once again the Mediterranean diet carries with it this romanticized version of what was consumed. So, let me explain. The Mediterraneans do not eat tons of fresh fish every day. Greeks consumed small fish like sardines and anchovies and especially the Greeks that lived in the mountainous regions did not even eat fresh fish as often as we think. They often ate cured or marinated fish and again consumed it as a side dish. A fine example of this is eating marinated sardines along with a bowl of lentil soup. Those who lived near the coast had easier access to fresh fish, while those who lived in mountainous areas bought their fish from the fishmonger who would come once or twice a week in summer, less often in the winter, if at all. The point is that you do not need to look for expensive fresh fish to follow a Mediterranean diet, even the Mediterraneans did not do that. While you can add them to other foods, enjoying them as a side with the vegetables as the main course is the most simple way to consume them. 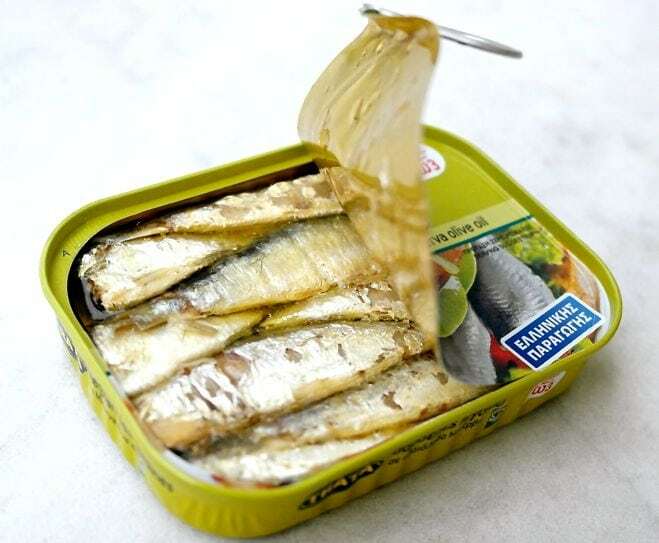 Look for sardine or anchovies packed in olive oil. Sometimes I add a few drops of vinegar or lemon and some oregano. Serve them along beans such as lentils and chickpeas, it is a very typical combination here in Greece. Heat them along with some tomato and onion and a bit of olive oil. Make a spread and serve on toast. Enjoy them on piece of toasted bread along with tomato, greens like arugula and a sprinkle of pepper. Add them to pasta, my favorite being puttanesca. With just 3 ounces (about 100 gms) twice a week you get the recommended omega-3 fatty acids dose you need. Remember omega-3 fatty acids are essential fatty acids, that means our body needs them to function. But they also appear to protect the heart and from various other chronic diseases. In the westernized diet, we get too little of them unfortunately. So go ahead and buy those canned fish, don’t be embarrassed, you’re actually being smart. It’s a perfectly respectable way to get fish in your diet, especially if you have no access to fresh fish or just hate the idea of cooking fish at home. One of our favorite quick lunches is canned sardines mashed with Dijon mustard, served with whole-grain bread and whatever vegetables I have around. Do you make Sicilian-style Pasta with Sardines (Pasta con le Sarde)? Spaghetti with canned sardines (plus onion, tomato, etc), topped with toasted breadcrumbs. Delicious! I make pasta putanescca usually with the anchovies, but this Sicilian pasta, sounds very tasty! La pasta con le sarde is delicious. Does little wild fennel (finocchietto selvatico) grow in Greece? There are also pine nuts, toasted almonds, saffron, currants or other small raisins … but you can make a much simpler dish with sardines, and good tinned ones are fine. This dish would also be very good with dill, something I know you have in Greece. Your Greek olive-oil sardines look delicious. Thank you for another great article. We eat very little meat but have fish four to five times a week. I love my canned Norwegian sardines (my family is from Norway)and although they are a bit pricy I enjoy them two or three times a month. When other fish is too expensive I use canned wild caught salmon, my husband and I love it but our kids think it is just okay. I recently discovered pasta putanescca and love that. I don’t eat any cheese due to high cholesterol and I was glad to find something on the menu at an Italian restaurant that I could eat. I love your site and have recommended it to my best friend who married into a Greek family. She has taught me to cook some of the recipes that her late mother-in-law taught her. What excellent, helpful and useful articles Elena! Thanks so much, keep on going because we learn a lot! Thank you Hanneke! I’m glad you find the information useful. I’d love more ideas for cooking with canned sardines, etc. they’re such a strong flavor that the dish needs to be centered, but I run out of recipes! I’m working on that Jennifer. I have a few I have already tried and will be posting soon! Never thought of that! great idea. I don’t like sardines much, but canned tuna, yum! 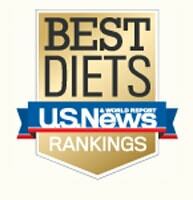 Thanks!Canned tuna is also a great source of protein, but not so much omega-3 fatty acids. Hi Kate, I am planning something like this in the future. Eλενα δεν ήξερα ότι ψάρια σε κονσέρβες έχουν τόσα θρεπτικά συσταστικά και το ότι είναι καλό να τα καταναλώνουμε…. τέλεια. Ευχαριστώ για την πολύ ωραία πληροφορία. Hello Elena, first of all, I love your site and all these wonderful recipes you provide! 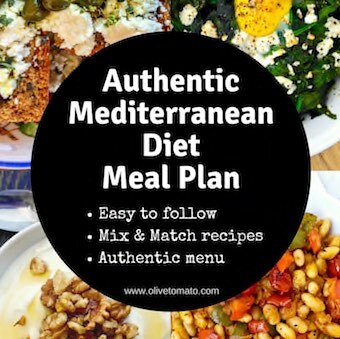 In the last few months I decided to do an overhaul of my diet, one point was considering going keto, but considered it not right for me because of some other health issues I have, then I came across the Mediterranean diet and have absolutely fallen in love! I liked my vegies before.. but now I LOVE them, it is amazing what the Greeks could do with vegies and make them to lovely! Especially the latheras! I’ll to the point, I’m struggling with some things however with the diet, one is trying to eat lowfod map. The other gluten free with some dishes.. how would you suggest I best handle this with the diet\mealplan? Most of the “bread” I have started to eat now instead of the overly processed, carb filled gf bread is my own low carb, gf version of pita bread. It’s quite good. Also, I just can’t learn to love anchovies… I just can’t stomach them, they taste like off fish to me.. (the canned variety) no matter how I “,cook”, them.. and i can’t seem to find the fresh variety in my country (Australia) state (brisbane). So I eat mostly tinned salmon and just recently bought some sputhern blue Whiting fillets … Amy suggestions as to other varieties of fish that I could try that have similar health benefits to salmon or anchovies??? Ones I can get in Australia? I haven’t as actually tried sardines yet, but as far as I understand, they aren’t much different in taste to anchovies..